Raiymbek Batyr was a famous Kazakh warrior from the 18th century. 'Batyr' is an honorific term meaning hero in the Khazakh language, his given name being Raiymbek. 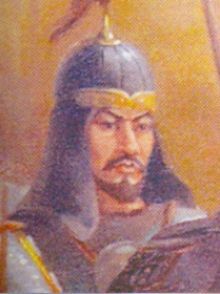 He actively resisted the Dzungar invasion of Kazakh territories and played a major role in liberating the Kazakhs from Dzungar rule. He was the grandson of a diplomat, and prevailed on the Russian czarina Anna Ivanovna asking for protection from the Dzungars, one of the Oirat (West Mongolian) tribes that were the last remnants of the Mongol horse archer empire. He was instrumental in bringing the senior juz into a closer relationship with Russia. He is the subject of a two-volume historical novel bearing his name. His name is commonly given to public features in Kazakhstan such as streets and mosques.